Makes about 3 dozen meringues. Using the whisk attachment on a mixer, beat the egg whites on medium speed until small bubbles start to form. Then, on high speed, and beat until stiff peaks form. Scrape sides of the bowl. Gradually, a little at a time, add in the sugar as the egg whites continue to beat on high speed. After the sugar is all added, continue on high speed for about 5 minutes until stiff, glossy and able to hold it’s shape on a spoon or whisk, even when turned upside down. Scrape sides of the bowl and then add the vanilla extract and lemon juice, beating for 1 more minute. Scoop out mounded spoonfuls of the meringue onto the baking sheets, leaving about 1-2 inches in between each. 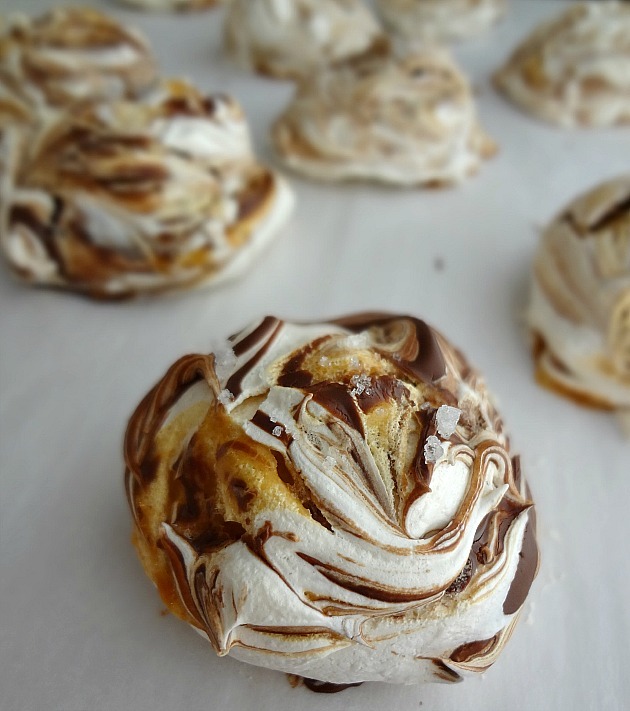 Using smooth and liquid-y, but not hot, chocolate and caramel sauce, place a small dollop of each onto the top of each meringue (using doing 1 row at a time is easiest) and then, using a toothpick, swirl them and shape the meringues as desired (don't flatten them very much). Change out for a new toothpick as needed. 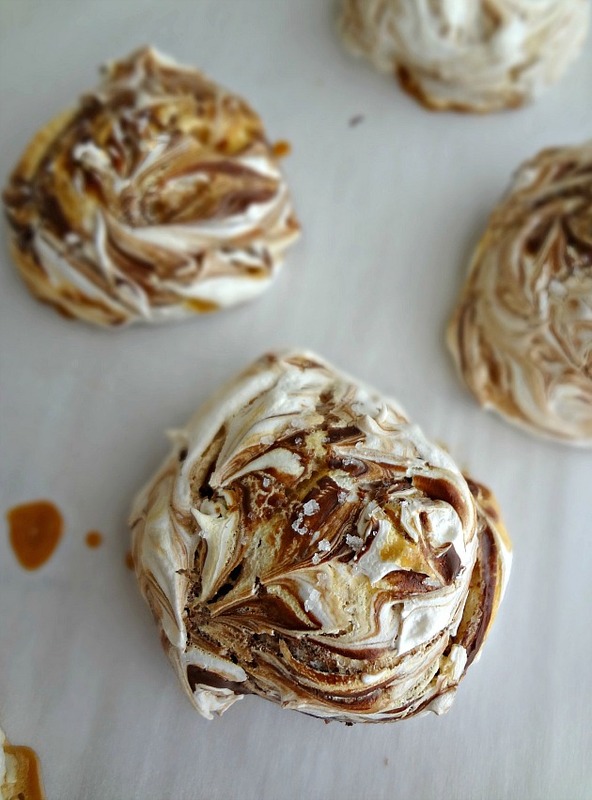 Sprinkle the tops of the meringues with sea salt. 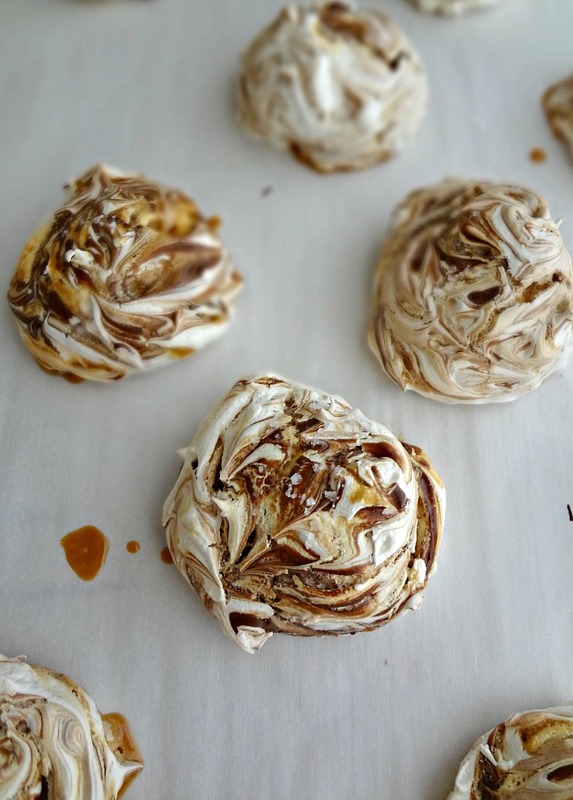 Put the baking sheets with swirled meringues into the preheated oven, lowering the temperature to 250F degrees. Bake for about 40 minutes (if you're using the upper and lower third racks of the oven you may want to, halfway through, switch the racks the 2 baking sheets are on and rotate for even baking). 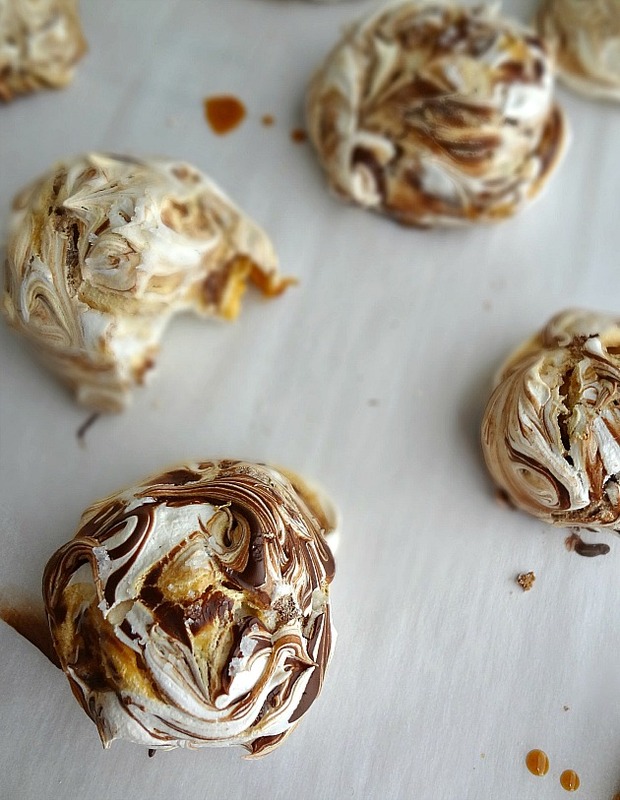 You want the meringues to be dry to the touch and, if you broke one open, no longer wet on the inside as well.